One of the best places to see feral Colonial Spanish Mustangs in the United States. Wild horses were abundant in the Americas until about 13,000 years ago. Luckily, they had already spread around the world by the time they became extinct within their native land. Thanks to the Spanish conquistadors from whom they escaped in 16th century, horses returned to the continent, though they’re now considered feral instead of wild. 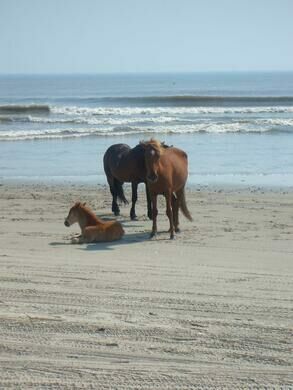 Corolla, North Carolina is one of the best places to see the Banker horse, a rare breed that descended from the escaped Spanish stock. 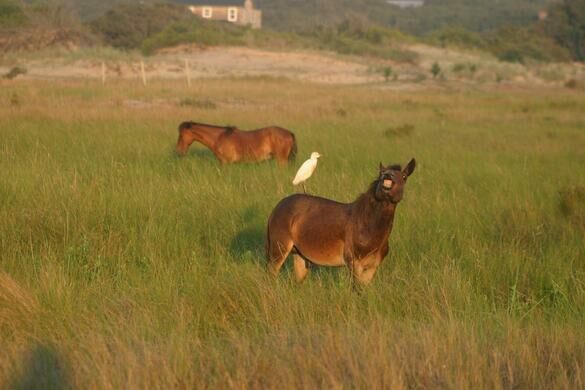 The Banker strain of the Colonial Spanish Mustang lives on the barrier islands of the Outer Banks. It’s one of the oldest horse breeds in the United States. They’re a small, hardy stock—so small, they should technically be classified as ponies and not horses. Their short backs and low tails make them distinctly different from other types of American mustangs. 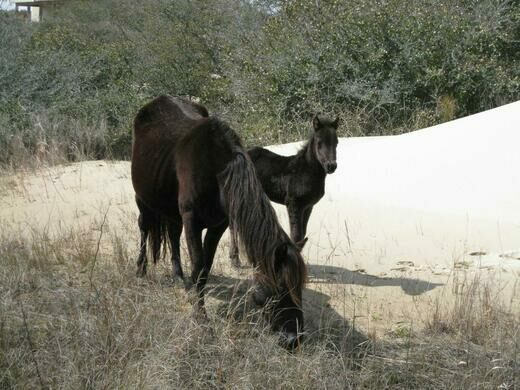 Because of their relative isolation, the Banker horses around Corolla haven’t had a change to mix with other breeds and dilute their Spanish lineage. How the horses actually arrived in the area is still a bit of a mystery. Some suspect they swam ashore after surviving shipwrecks. Others think they were simply left behind when the Spanish conquistadors abandoned their North Carolina colonies. The mysterious origin story adds to their allure. 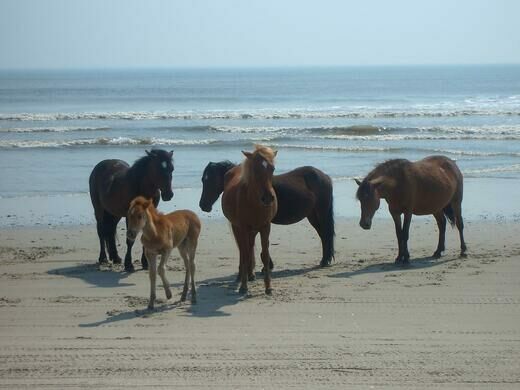 Horse tours are one of the main economic activities in Corolla. 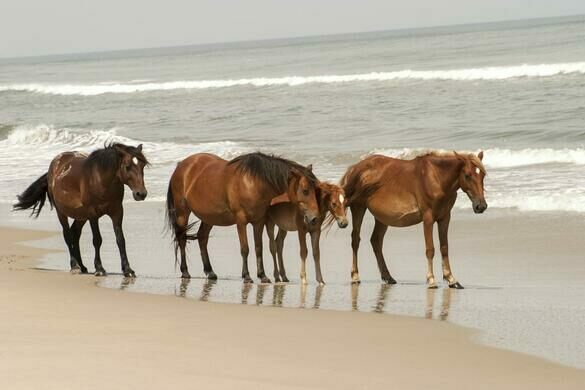 Because of the hordes of visitors each week hoping to catch a glimpse of the herd, authorities became concerned about the well-being of the few hundred feral horses roaming about the area. There are now beach patrols in charge of educating people about the equines and how to coexist with them. It’s illegal for anyone to come within 50 feet of the horses. 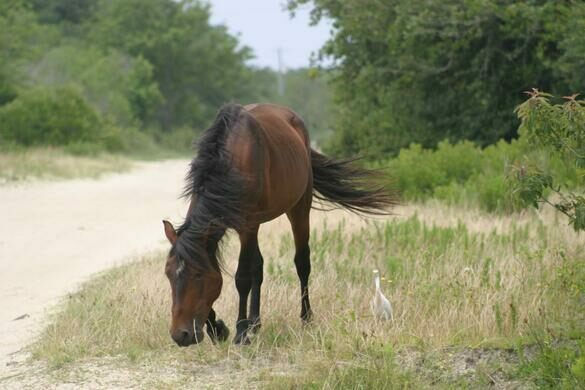 The GPS coordinates and address lead to The Corolla Wild Horse Fund. The best way to enjoy viewing wild horses is with an off-road vehicle. However, it is not recommended that visitors do it on their own, as they often get too close to wild horses, and even sometimes hit them and kill them. Take a guided tour instead. There are eight tour operators, most popular being Wild Horse Adventure Tour. The unique circular corral belonging to the “Cattle King” of Oregon. Where the English trapper who faked a First Nations identity bunked with beavers.